"Royal Purple’s API-licensed Motor Oil combines premium base oils with proprietary additive technologies to create high performance motor oils that optimize engine performance. Royal Purple’s API-licensed motor oil delivers superior protection and improves performance in gasoline and diesel engines. 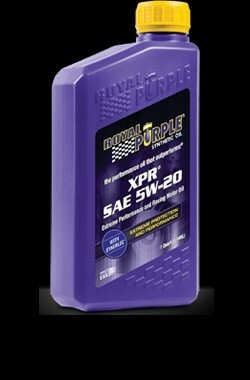 Royal Purple’s API-licensed SN motor oil meets ILSAC GF-5 and Dexos1™* performance requirements. No special procedures are necessary when upgrading to Royal Purple. Royal Purple recommends waiting until the manufacturer’s first scheduled oil change in new gasoline and diesel engines before upgrading to Royal Purple. 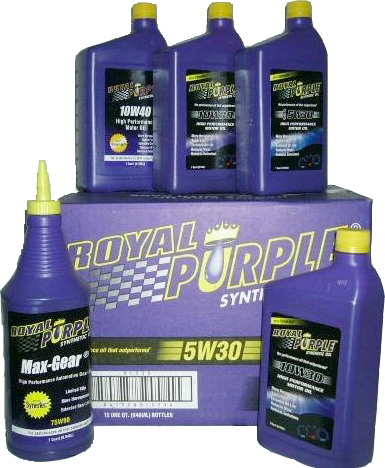 Royal Purple motor oil is compatible with synthetic and conventional motor oils. Available viscosities include: 5W-20, 5W-30, 10W-30, 10W-40, 15W-40 and 20W-50 weights." 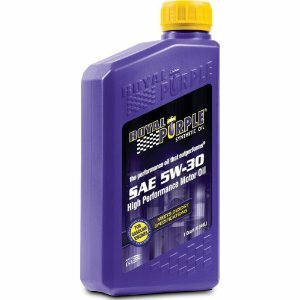 Royal Purple HPS Series motor oil is specifically formulated to maximize performance and meet the demands of high performance and modified engines. HPS is recommended for vehicles no longer under manufacturer warranty and for those seeking a higher level of performance and protection. This unique blend enables HPS to outperform leading synthetics and conventional lubricants for both gasoline and diesel engines. Royal Purple’s HPS is fortified with a high level of zinc/phosphorus anti-wear additive and Royal Purple’s proprietary Synerlec® additive technology. Available viscosities include: 5W-20, 5W-30, 10W-30, 10W-40 and 20W-50. 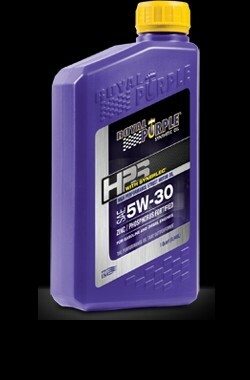 Royal Purple HPS Series of motor oil responds to increased pressure with increased viscosity. It’s advanced additive technologies, such as Synerlec, improves the condition of metal-to-metal contact under severe conditions for greater protection. "XPR — Extreme Performance Racing oils are formulated for demanding applications such as racing, modified engines and off-road use. XPR’s high film strength make it exceptionally well-suited for today’s high performance cars and trucks, particularly turbo and supercharged engines and / or engines using a nitrous boost. XPR produces winning results on the race track and is safe enough to use in your daily commuter car. Professional engine builders and race teams cite increased horsepower and torque, and longer engine life with the use of Royal Purple. Be sure to follow the manufacturer's and / or engine builder's recommendations when selecting an oil viscosity." "Max-Gear is an ultra-tough, high performance, GL-5 automotive gear oil designed to provide maximum protection to heavily loaded gears while maximizing power output throughout the drive train. It outperforms other GL-5 gear oils because it combines the highest quality synthetic oils with Royal Purple's proprietary Synslide additive technology. Max-Gear makes gears run smoother, quieter, cooler and longer without overhauls. All viscosities of Max-Gear are formulated with hypoid friction modifiers necessary for use in clutch or cone type differentials. No additional additives are necessary". "Synchromax is formulated with Royal Purple's synthetic, proprietary Synerlec additive technology, which offers improved shift quality over a wide temperature range and reduced gear noise. Synchromax is fully compatible with all types of friction materials and offers excellent corrosion and oxidation protection without affecting the soft metals commonly found in manual transmission synchronizers. 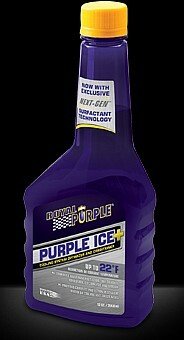 Try Royal Purple today and Feel the Difference"! "Max ATF is a synthetic, high performance, long life, multipurpose, automatic transmission fluid. It's more oxidation stable than other transmission fluids for a longer fluid life. Max ATF's low co-efficient of friction and high film strength help to dramatically reduce heat and wear. Max ATF significantly reduces heat to extend the life of your transmission and is recommended for all automatic transmissions requiring Ford Mercon® or GM Dexron® III transmission fluids. Max ATF is fully compatible and can be mixed with other automatic transmission fluids; however, for the best results drain or flush the current oil and then fill with Max ATF". "Engine builders have grown increasingly concerned that many modern motor oils do not provide adequate wear protection for new engines, particularly those using flat-tappet cams. 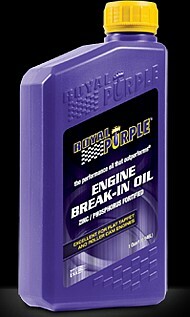 Royal Purple has addressed this issue by developing a new engine break-in oil. Royal Purple Break-in Oil is formulated to allow optimal ring seal and protect rotating assembly components such as the camshaft and valve train from initial start up wear. Royal Purple combines highly refined mineral oil, preferred for engine break-in, with advanced additives containing high levels of zinc and phosphorus to optimize protection in flat-tappet and roller engines. Royal Purple Break-in Oil is fully formulated and does not require the use of any other chemical additives. 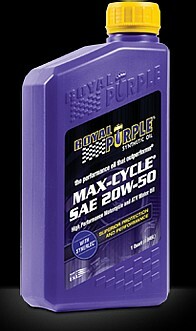 Royal Purple recommends using their high performance motor oils after the engine is broken in for maximum engine performance". "Royal Purple’s New Max-Clean is a state-of-the-art high performance synthetic fuel system cleaner that maximizes the performance of your fuel system. Max-Clean restores fuel economy and deeply penetrates and cleans injectors, carburetors, intake valves and combustion chambers". "Max-Cycle provides unparalleled film strength that is up to 400 percent stronger than the leading synthetic and mineral oils. Its shear stability and oxidation resistance promote greater performance and protection. Formulated with select synthetic base oils and Royal Purple’s proprietary Synerlec additive technology, Max-Cycle greatly reduces engine wear — including ring, cylinder and bearing wear. It continuously adheres to metal surfaces, even after shutdown, to provide instant protection at startup until a full fluid film can be established. Max-Cycle exceeds API / JASO new warranty requirements and is compatible with other mineral and synthetic motor oils. No flushing is necessary prior to use. It’s available in 10W30, 10W40 and 20W50 viscosities." All Royal Purple trademarks & copyright material belongs to Royal Purple LTD of Porter, Texas(USA). The manufacturer of Royal Purple synthetic oils.